Happy Friday! I wanted to do a little stamping before I head over to school. The Free For All Challenge on SCS was to use hexagons. 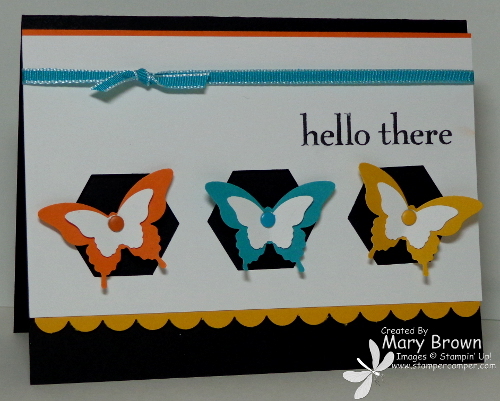 Since I needed to do a QUICK card before I head out, I decided to build my card around these butterflies that were sitting on top of my desk…you know how I like to do that! Whisper White 3 1/4 x 5 1/2. Punch three hexagons across the bottom and stamp greeting using Basic Black. Add a Crushed Curry Scallop Edge Punch along the bottom and a Pumpkin Pie strip along the top. Tie Bermuda Bay 1/8″ Taffeta Ribbon along the top. Add panel to card front using dimensionals. Yep…that’s about it. To me this is a real ‘throw back’ to when I first started stamping and we really didn’t have a lot of ‘extras’ to work with. I do like the simplicity of the look. This entry was posted in Challenge and tagged Happy Day. Bookmark the permalink.